Karee brought us this top a few weeks ago to quilt for her. She was trying to use up some stash and had several fabrics that worked perfectly together. In fact, she had enough for a front and a back – a reversible quilt! Karee’s top consisted of mostly floral fabrics with a few polka dots for good measure. 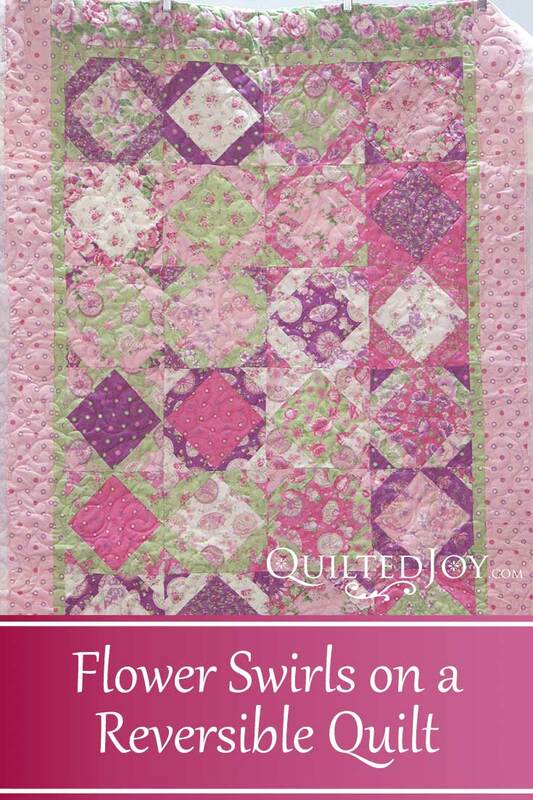 A pantograph is perfect for a top that already has a lot of pattern in it, and she chose one called Flower Swirls. We decided that a light pink thread worked best with the different fabrics – it contrasted less with both light and dark fabrics. When we quilt a reversible quilt on a longarm, it is difficult to precisely position the top and the backing to keep the back design centered vertically. They can be loaded so that they are precisely centered in relationship to each other, but there may still be a little drift during the quilting process. Adding wide borders can help to camouflage a slightly off-center back. Karee’s reversible quilt finished up pretty well centered, and now her stash is a little smaller, too! Next post: Are You Coming to MQX Midwest?